Children are meeting Jesus in over 74,000 Good News Clubs around the world, being discipled in the Word of God and getting connected with churches. But it is illegal to share the Gospel in North Korea. Pray that God will make a way for boys and girls in North Korea to learn about Jesus through Good News Club®. One day Good News Clubs will be meeting in North Korea and all glory will go to God. How encouraging it will be when children around the globe see how God answered their prayers for GNCs in this country! The eyes of the world are on North Korea. 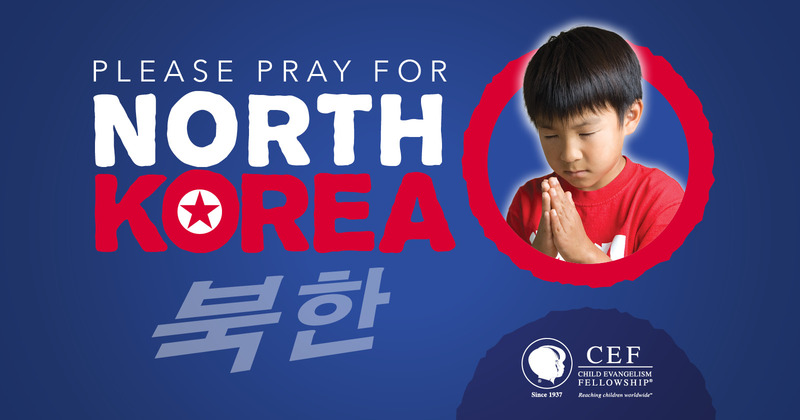 “God has given me a strong burden to mobilize millions of boys and girls around the world to pray for the children in North Korea,” says Reese Kauffman, president of CEF. These children need, “to be able to attend a Good News Club and hear about Jesus.” Children in Ghana, Senegal, Cuba, USA, and all over the World are fervently praying for the children of North Korea. Jesus said, “Let the little children come to me and do not hinder them, for to such belongs the kingdom of heaven” (Matthew 19:14). God will make a way for boys and girls in North Korea to learn about Jesus through Good News Club. Digital resources to encourage children in your church with the urgent call to pray for the children of North Korea are available upon request.